In addition to all the baseball games this week, I have been busy getting ready for Halloween. I am not really big into costumes, since I went all out during my college years, but my dog Ralph will be wearing a pretty amazing costume this year. 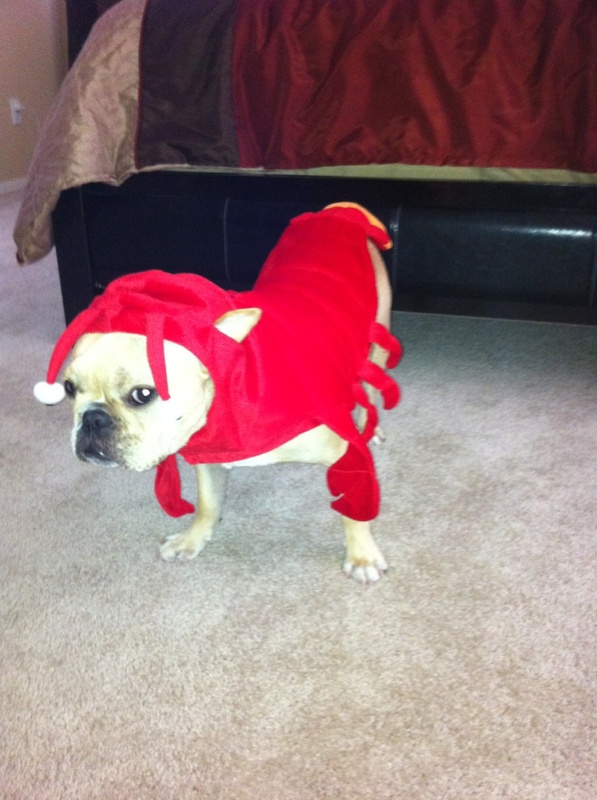 “The Lobster” that will be greeting Trick-O-Treaters at my house on Monday night. Along with getting ready for Halloween, my girlfriend and I have been busy entertaining her parents that came in from Mississippi. We had the chance to check out the AZ State fair and eat at some great restaurants around Scottsdale. One of our favorite spots has become Don and Charley’s. This place feels like a Chicago style steakhouse and has some amazing baseball memorabilia. Their prime rib and BBQ is some of the best I have ever had, and I think that any baseball or food lover should definitely go check this place out. I just finished watching the World Series, and it makes me even more thankful that I get to play this game as my profession. Ralph appreciates the compliment and the Frenchie breed is amazing. Unfortunately, we were faced with a few problems with his breeder and I would not recommend his breeder. One piece of advice, make sure you do a background check on the breeder you choose and visit the location in person prior to falling in love with one! We got very lucky with Ralph but there are a lot “bad” breeders in the bulldog world.